A disgruntled gamer sent police to an innocent family's home and when an unarmed man opened the door, a police officer killed him for no reason. Wichita, Kansas — This week a 28-year-old man was shot dead in his doorway by police after a SWAT team was sent to his house on a false report by a disgruntled gamer. While the full details are still unclear and police have not made any official announcements, it has been widely reported that this is likely the result of a “Swatting” prank that started over a video game. “Swatting” is when an extreme false report is made about someone, usually involving murder or hostages, which causes a SWAT team to raid the individuals home, putting them in serious danger. 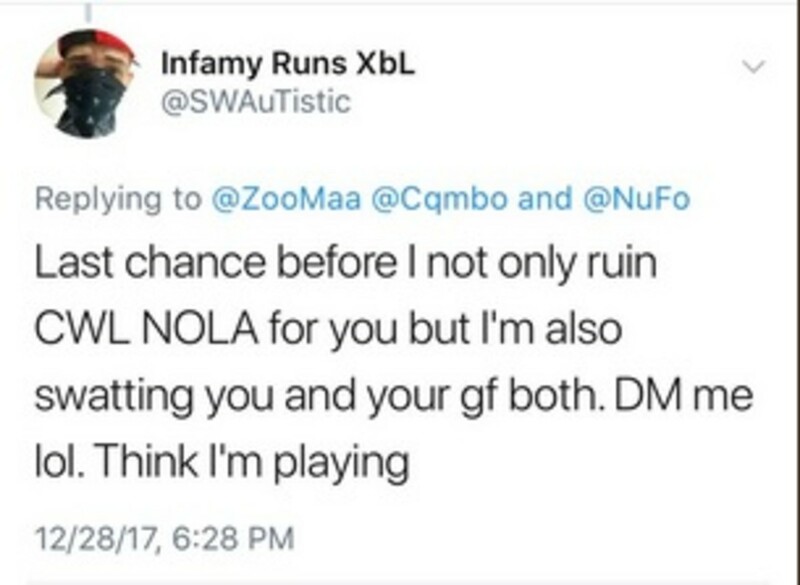 It is estimated that over 400 swatting incidences occur in the US each year, and many of them stem from online feuds and video games. However, while the victim, Andrew Finch, was not involved in the game himself, his address was given out during an argument in an online Call of Duty match between two other people. Deputy Wichita Police Chief Troy Livingston told reporters on Thursday night that his department received a report that a person at that address was holding an entire family hostage after killing the father. “It was a shooting call involving hostages. The original call, we were told someone had an argument with their mother and dad was accidentally shot, and now that person was holding mother, brother and sister hostage. We learned through that call that a father was deceased, and had been shot in the head. That was the information we were working off of,” Livingston said. According to Kansas.com, officers arrived at the 1000 block of McCormick, where the Finch family lived, and “got into position” for a hostage situation. Shouldn’t 911 be able to tell when a call is coming from nowhere near the crime scene? It is highly unlikely that the prank caller just happened to be in the same neighborhood as the victim. Even with a cell phone, what are the odds it was a local area code? It is likely that the caller took measures to mask their identity, but if that was the case police should have been able to know that up front as well. Andrew’s mother, Lisa Finch, told reporters that police murdered her son, and that he was unarmed and posed no threats to the police. She added that no guns were found in the house and that her son was simply opening the door to see why there flashing lights outside. “We want Andy’s side of the story to be told,” Lisa said. “I heard my son scream, I got up and then I heard a shot. What gives the cops the right to open fire? Why didn’t they give him the same warning they gave us? That cop murdered my son over a false report,” she said. “He was very kind and caring. He was in gifted classes. He was very artistic. He would draw any picture … He would do anything for his family,” she added. Police have not released the name of the offending officer but they did say that he will be placed on administrative leave. Breaking: The SWATTER was ARRESTED! The family wants both the officer and the caller to be held accountable. Overnight, police released body camera footage of the incident and accused the young man of “reaching for his waistband” as he opened the door. However, when a person is standing up straight with their hands at their sides, which it appears the victim was doing, hands naturally rest around the level of the waistline. “Officers gave him several verbal commands to put his hands up and walk towards them. The male complied for a very short time and then put his hands back down to his waist. The officers continued to give him verbal commands to put his hands up, and he lowered them again. The male then turned towards the officers on the east side of the residence, lowered his hands to the waistband again, then suddenly pulled them back up towards those officers at the east. The officers on the north side of the street feared the male pulled a weapon from his waistband, retrieved a gun and was in the process of pointing it at the officers to the east. Fearing for those officers’ safety, the officer on the north side fired one round,” Livingston said in a second press conference.